Nearly every U.S. and Canadian metal plate connected wood truss manufacturer has one or more clients who either construct pole barns or sell kit packages. Not much excitement though in dealing with typical orders of usually anywhere from four to 10 trusses per building. Money can certainly be made in post frame industry sales. My 1990’s truss plant, based in Spokane, Washington, almost exclusively built pole barn trusses. 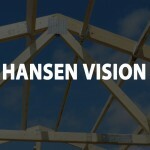 It was not unusual for us to have backlogs of weeks and when it came to post frame trusses. We dominated Northwest U.S.
We tailored our inventory to best build to our client’s needs. By having 2×6 2850msr and 2400msr in wider widths, we could provide smaller dimension chords than our competitors, with lighter trusses. Considering jobsite manhandling involved, lighter weight trusses are an advantage! And let’s face it – those high grades have very few visual defects, resulting in some very pretty trusses! Also in our inventory, for web stock, was msr 2×3. Many truss webs can be higher grade 2×3, rather than 2×4. Again, much 2×3 msr was much prettier wood than 2×4 visually graded material others were using, not to mention saving truss weight. Webs requiring lateral bracing were checked to see if a larger dimension or higher grade would eliminate bracing. Installing job site bracing take both material and labor, reducing braces for a minimal investment makes for happy clients. Being able to be different in the post frame industry gives one a leg up, where virtually everyone does things alike. When a truss client can say, “I do things just like everyone else and also provide….” to their potential customer, it gives them an advantage. Most post frame roof trusses will be 40 foot spans or less. Point out very small price differences to add five or 10 pounds per square foot (psf) of load to top chords. Many post frame trusses are designed with a bottom chord dead load of one or two psf. One of my most asked questions of my Ask The Pole Barn Guru™ advice column – is how to add a ceiling to post frame buildings. A five psf bottom chord dead load would solve this dilemma. Both of these are points your client can use to sell why he has a better building than Brand X. Your delivery truck starts spinning dollar signs an instant a key gets close to an ignition switch. Since you are going to make a jobsite trip, why not add more product? True glu-laminated post frame building columns are a wonderful thing – strong, light weight and straight. In most instances a product of 1650f three ply 2×6 glulam will replace 6×6, 6×8 and in some cases 6×10. Downside of glu-lams – current lack of distribution, as manufacturers are primarily in South Dakota, Wisconsin and Pennsylvania. Work with a manufacturer to bring in ¼ or ½ of a truckload of 14 to 24 foot lengths, they might even help to floor some inventory. Once builders start using them, they will never go back to solid sawn columns. This provides another differentiation for your client and it helps to tie them to you as their supplier. With 2×6 1650 msr being over 40% stronger than best commonly used visually graded #2, you can do your client some favors in helping to point out strength and quality benefits. Side benefit for you – quicker inventory turns. Buy more lumber get better negotiating power with wholesalers and mills. Glu-lam column and selling lumber margins are not going to be as high as your truss margins, expect maybe 20%, however consider this a bonus profit you would never have otherwise had. I always felt 20% of something beat 100% of nothing every day. 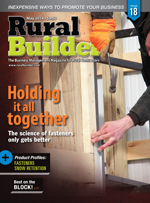 Expand your post frame building industry view and increase your bottom line! This entry was posted in Pole Barn Design, About The Pole Barn Guru, Pole Barn Planning, Pole Barn Structure, Trusses and tagged pole barn trusses, glu-lams, metal plate connected wood trusses, post frame industry sales, lighter trusses on August 29, 2018 by admin. “Trusses store best when standing upright. Shore and brace standing trusses well to keep from toppling. Trusses not stored in a vertical position can and will warp, and become difficult to use. Store trusses with “tails” (overhangs) so truss weight does not rest on tails. Unload trusses in bundles and store on level ground, but never in direct contact with ground (to avoid collecting moisture from ground). Allow for good drainage at truss storage location in event rain occurs before installation. Protect trusses from damage resulting from on-site activities, environmental conditions or elements. Exercise care at all times to avoid damage to trusses due to careless handling during delivery, unloading, storage, and installation. In warm, rainy weather, moisture regain in unprotected trusses can result in fungal staining. Wetting lumber also results in swelling. Subsequent shrinkage of framing may contribute to structural distortions. No particular plate type in this study showed markedly different back-out performance or retained tooth holding capacity than other plates tested. For all plates, storage under cover, even if it was just another joint, was better than direct exposure. No excessive corrosion was noted of any type of truss plates, nor were tooth holding reductions considered significant with respect to their magnitude..
this is likely due to occurrence of plate back-out due to repeated wood shrinkage and swelling. 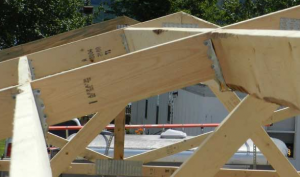 Typical practice of permitting trusses to be exposed to environment for a short period of weeks or even months after truss fabrication and before closing in structure is confirmed as not resulting in an excessive loss in strength and is therefore acceptable with respect to joint strength……..
From this work we believe SBCA will be able to provide best practice counsel with respect to storage, truss plate performance and, most importantly, define any effect on overall truss performance post-installation. This entry was posted in Building Overhangs, Trusses and tagged metal plate connected wood trusses, truss tails, storing trusses, truss shrinkage, truss metal plates, SBCA on August 17, 2018 by admin.